☞ Are you looking for someone to finish your app quickly and with a high quality? ☞ Do you want someone to convert just an idea in your head to a real app that makes you gain a lot of money? ☞ Do you have a business and you want an app that helps your clients able to contact you and request your services easily? ✔ You are in the right place! 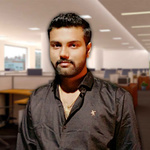 - I'm a native android application developer having 4 years of experience. - I have successful projects with clients in Europe, USA and Australia. - You'll find me a very friendly developer, cooperative and easy to work with! I am professional mobile application developer having 4 year of working experience.I have successful projects with clients in Europe, USA and Australia. Here is my skills overview...Read moreI am professional mobile application developer having 4 year of working experience.I have successful projects with clients in Europe, USA and Australia.